Craftsmen, distillers, herbalists, gatherers, cooperatives or laboratories belonging to the essential oil industry all have a common need : the conditioning of their hydrolats and/or natural essences while respecting the many constraints of a highly regulated sector. To meet these needs, CDA manufactures the labelling machine, filling machine or complete line perfectly adapted to essential oil producers. CDA has been designing and manufacturing labelling and filling machines as well as complete packaging lines for essential oil producers (lavender essential oil, arvensis mint, eucalypthus, lemon, orange, sage, ravintsara, ylang-ylang, rosewood…) for nearly 30 years. Adhesive labelling machine specially adapted to small vials, essential oil filler or complete packaging line including essential oils’ filling, hydrolats or floral waters, screwing of dropper caps and pipette tip, and labelling of glass or PET vials… CDA offers essential oils’ multiple packaging options for 10mL, 15mL, 20mL, 30mL bottles, etc. The smallest distillers and essential oil producers will benefit from our semi-automatic solutions when the largest cooperatives, distillers and natural materials laboratories will enjoy our automatic machines and complete packaging lines. Pickers, distillers and small producers looking for a semi-automatic labeller to optimize their labelling productivity will turn to our semi-automatic labelling machines for essential oil bottles (orange, lavender, tea tree, peppermint, lemon, niaouli…). Our range of automatic labelling machines is adapted to the rigorous regulatory constraints to which essential oils’ vials must comply: the presence of numerous legal notices on the label, the need to apply wrap-around labels or book labels to display these inscriptions…. For the filling of your essential oils, you can rely on our semi-automatic filling machines to dose your small and medium production of essential oil bottles from 5mL. Our experts will analyze the corrosive nature of your liquids to provide you with the appropriate solution. For an accurate filling of your oils’ bottles (aromatherapy), food flavours or perfumery components based on essential oils, choose a CDA automatic filling machine. Our team is there to assist you and analyse the corrosive nature of your products. In addition to its machines, CDA offers various complementary solutions to optimize the packaging of your bottles: conveyors, products feed tables, screwing solutions for dropper caps, spray pump caps… Find out more about our complementary solutions. Essential oils’ production has been growing steadily for many years, following the explosion of aromatherapy but also its multiple uses as a component in perfumery or food flavours. Essential oils, hydrolates and floral waters of orange, lemon, lavender, mint… produced by pickers, herbalists, distillers but also cooperatives must respect a growing number of constraints. Corrosive nature of the oil, obligation to display legal information on the label, presence of a child-resistant safety cap… are all variables to be taken into account when choosing a filling machine, a labelling machine, a screwing machine or a complete packaging line to package essential oils’ glass bottles. 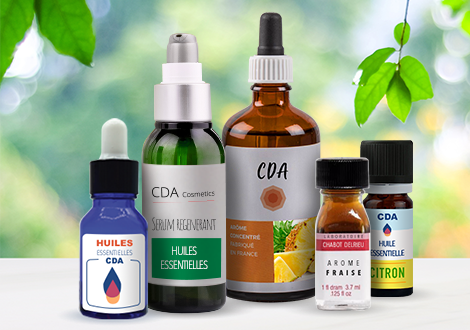 Able to label and fill small containers like 10mL, 15mL, 20mL or 30mL vials, CDA offers a wide range of semi-automatic and automatic machines covering the disparate needs of the very diverse actors belonging to the essential oils industry. Small containers’ accurate filling, special caps’ screwing (spray caps, pump caps, dropper caps…), semi-automatic or automatic application of wrapping labels or book labels… Our range of machines and our expertise allow us to analyse your specific needs to provide a suitable solution. Plants or fruits producers who carry out distillation, processing and even the sale of their small production of essential oils, hydrolats and floral waters will be able to purchase a semi-automatic machine to optimise the filling and labelling of their vials. Our semi-automatic range meets these needs. Essential oils industry's actors being confronted with important productions and therefore wider packaging needs, will choose CDA's automatic machines. Our automatic labellers and fillers will increase productivity when packaging finished products. The largest essential oil producers are looking for total automation of their packaging processes. CDA responds to this problem with complete packaging lines specially adapted for filling, screwing and labelling essential oil vials. Our team of experts will help you to create the monobloc that suits your needs.